Happy Friday! I hope you've had a great week! Today, I'm sharing my weekly roundup of what I'm currently loving. 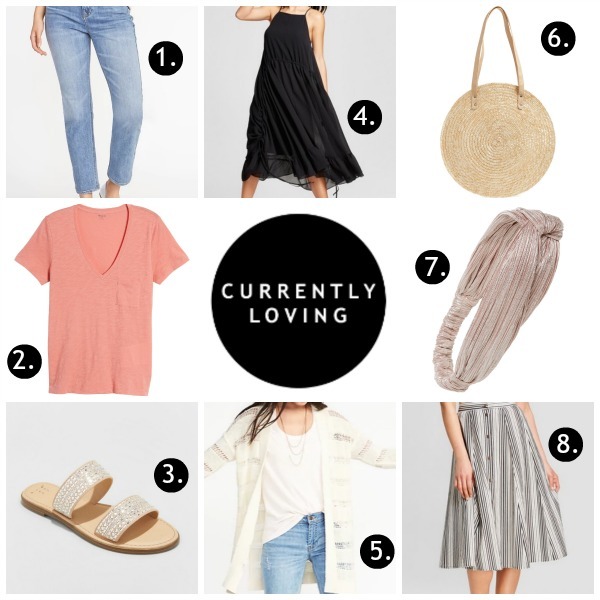 My picks this week can be mixed and matched for easy springtime looks! When I shop, I always try to pick pieces that can easily mix in with items that I already have so that it will be easier to create outfit combinations. Also, almost everything in this week's roundup is under $30! 1. Denim | I've been wearing these jeans for a few weeks and I highly recommend them! They are so soft and so comfortable for everyday wear. At work, I wear jeans every single day so I love finding a comfy pair without distressing so that they are work appropriate. This pair fits true to size. 2. Pocket Tee | I have several of these tees and they are amazing! The fit is relaxed (stick with your normal size) and the cotton is high quality. These tees wash up perfectly. 3. Sandals | I saw these sandals in the store last week and I fell in love with them. They are even prettier in person! They run true to size and are super comfortable. 4. Dress | My husband and I are headed to Mexico in June for our 10 year anniversary so I have been hunting for great dresses that I can throw on for dinner. I absolutely love this one! It's also under $30 and it's currently on sale for buy one get one half off. 5. Cardigan | A lightweight cardigan is a spring must have! I love the style of this one so much and the neutral color would go with everything. So perfect for throwing over a dress or with jeans and a tee. 6. Straw Bag | Straw bags are one of my favorite things for spring and summer! They are just so fun! I already own a similar bag to this one and I carried it almost every day last year. 7. Head Wrap | I'm currently loving hair accessories, especially head wraps! I just got this one in the mail and the color is so pretty. I think it will be perfect for spring and summer! 8. Midi Skirt | I have never owned a midi length skirt but this one is speaking to me. I love the buttons down the front and the stripes, of course. I think it would look so cute with a pair of sandals and a simple tee!